Training at Riccarton this week has been vital to Hearts’ preparations for the final nine games of a very eventful season. Some players are missing due to international duty but Ian Cathro and his coaching staff still have the bulk of the first-team squad to work with. Veteran centre-back Aaron Hughes has recovered from the calf injury which precluded him from his club’s last four matches. Ironically, he is one of the absentees having been given permission to join the Northern Ireland squad for Sunday’s World Cup qualifier against Norway. Arnaud Djoum is also away with Cameroon, Andraz Struna is preparing to face Scotland with Slovenia, Alex Tziolis is with Greece, Faycal Rherras is in the Morocco squad and Liam Smith is with Scotland Under-21s. Goalkeeper Jack Hamilton received a late call-up to the Scotland squad yesterday following the withdrawal through injury of David Marshall. Hearts expect most of the above to be back in place by the middle of next week. “A couple of things have slowed us down this week,” explained Cathro. “Krystian [Nowak] and Lennard [Sowah] are managing a couple of knocks but, given it’s this week, we expect both of them to be clear for full training next week. We don’t have any other concerns outside that. “Aaron had been back training with us for a couple of days before the Aberdeen game on Saturday. Sometimes in that situation you jump straight in. Maybe he could’ve come through the game, maybe he couldn’t. It’s sometimes a decision about protecting the player. Hearts are close to agreeing a one-year contract with Hughes, as revealed in yesterday’s Evening News. His leadership is considered crucial. The rest of the campaign sees Hearts playing catch-up from a position of fifth in the Ladbrokes Premiership. They hope to claim a Europa League qualifying place come May and there fore Cathro needs his most experienced men available. That doesn’t mean there is no role for younger members of the squad. 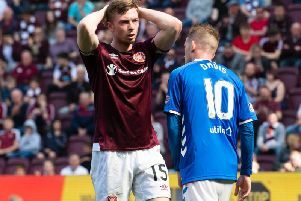 Teenage striker Rory Currie recently signed a long-term contract to commit his future to Hearts until summer 2020. He continues to impress his superiors. “Rory is a young player who, technically, is very comfortable in a lot of situations in games. He stays calm, he doesn’t get too stressed about things. That’s probably been the biggest thing which has helped him. He feels comfortable enough on the park to let some of this quality come out,” said Cathro. Currie only arrived at Riccarton last summer after being released by Rangers. His impact has seen him elevated from the under-20 squad into the senior group, where he is more than holding his own. Even Cathro admits that the 19-year-old has made an impression greater than anyone expected in his seven senior appearances to date.